Today was a day of rest for Ohiophotogrl and myself. We made omlets and hash browns for breakfast. We watched football and then studied for a bit. For dinner we made stir fry. Actually had some help from a chicken helper. Fried rice :0). Added some broccoli, carrots, and snap peas to the mix and dinner was ready! We even had fortune cookies. Tomorrow we are spending time with our favorite niece. I hear we are going some place fun. I love surprises!!!!! 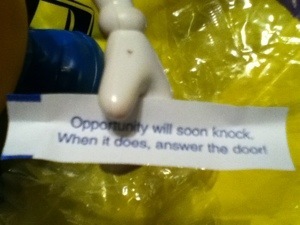 This entry was tagged 365, fortune cookie, fun, laugh, Mr. 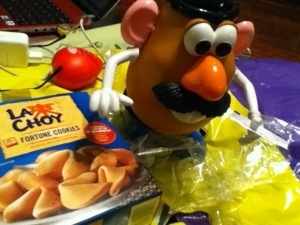 Potato Head, muse, photo a day, stir fry, surprise. Bookmark the permalink.